Below is an excerpt from an interview with John King, president and CEO of The Education Trust, and previously secretary of education for President Barack Obama. 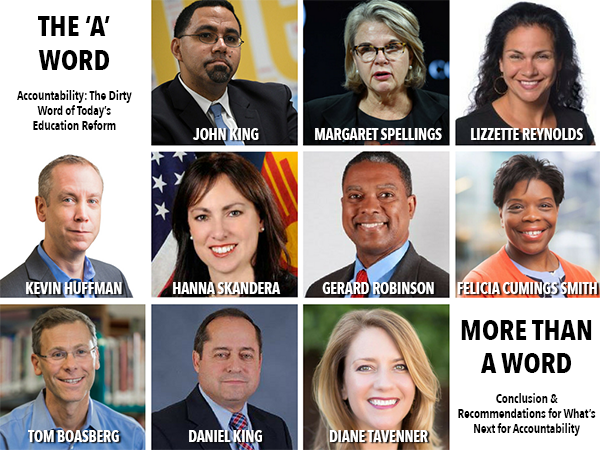 The conversation is part of The ‘A’ Word series, produced in partnership with the Bush Institute to examine how “accountability” became a “dirty word,” and what can and should be done going forward to ensure accountability withstands the test of a bad reputation. The interviews were conducted over the telephone, transcribed, and edited for clarity and length. The same questions, or types of questions, were put to each participant to see what they thought independently and collectively about accountability. Their answers will take the reader into the inner workings of schools, the intricacies of the politics of education, and the ways in which campuses can better serve students. Click through the grid below to read other ‘A’ Word conversations. 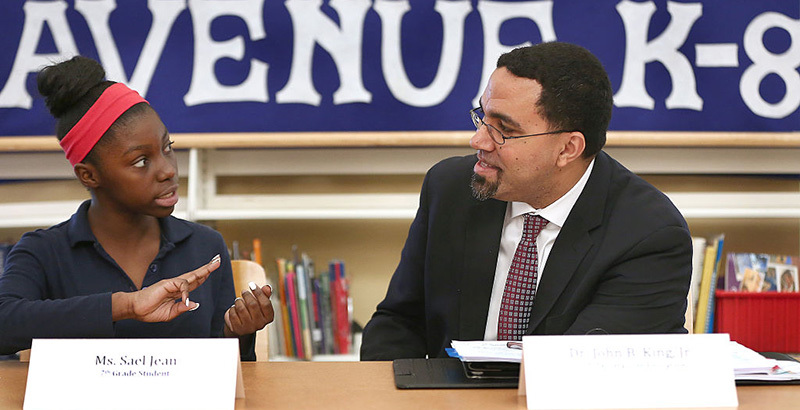 John King: Education equity means three things. One is that it means we are doing everything we can to ensure that education in America helps reduce inequality of opportunity. That means low-income students, students of color, and English learners have to be getting high-quality educational opportunities. They have to have the same ability to compete as their more affluent peers. Second, we need to consider that kids who have significant challenges in their life outside of school will need more support, more access to after-school and summer programs, and more assistance in navigating the transition between high school and college. They may be the first generation in their family to go to college. So equity means more than just getting the same. It means getting what they need to be able to take advantage of opportunity. The third piece for me, maybe the most personal, is that schools literally saved my life. I grew up in New York City and went to New York City public schools. In October of my fourth-grade year I was at PS 276 in Canarsie, and my mom passed away. I lived with my dad for the next four years. He was struggling with undiagnosed Alzheimer’s, so home was this place that was scary, and unpredictable, and unstable. I didn’t know what my dad would be like from one night to the next, and I didn’t know why. As he got more and more sick, I took on more and more responsibility at home to get food, pay the bills, and keep the household going. My father passed when I was 12, and my life could’ve gone in a lot of different directions. I could’ve very easily been dead, or I could be in prison today. The thing that made the difference was that I had great New York City public school teachers. They made school a place that was interesting, challenging, engaging, compelling, safe, and supportive. For me, the work on educational equity is about trying to make sure that every kid has the opportunity that I got to go to a great public school that will help them be the best they could be. Even after my dad passed, I moved around between family members and schools. It was always teachers who created an environment where I was able to make progress, even though lots of people would’ve looked at me and said, “African American, Latino, male student, family in crisis. What chance does he have?” I’m blessed that I had these teachers who just kept believing in me and seeing the hope and the possibilities.